ST. CEALLACH, OR KELLACH, BISHOP OF KILLALA, AND MARTYR. The earliest copy of St. Cellach's Life we possess at present is probably in that collection of prose and verse tracts, contained in the Leabhar Breac, or Speckled Book, otherwise styled Leabhar Mór Duna Doighré, or the Great Book of Dun Doighré. The following narrative, based upon it, does not conflict, except apparently in chronology, with what occurs in our general Irish annals. We find, also, among the Messrs. Hodges' and Smith's collection of Manuscripts, in the Royal Irish Academy, a Tract on the Life of St. Cellach. This is only a copy, taken from an original. A somewhat similar Life was in possession of the Irish Franciscans, at Louvain. It resembles that contained in the Irish Manuscript Codex, called by some Leabhar Mór Duna Doighré, but now better known as the Leabhar Breac. 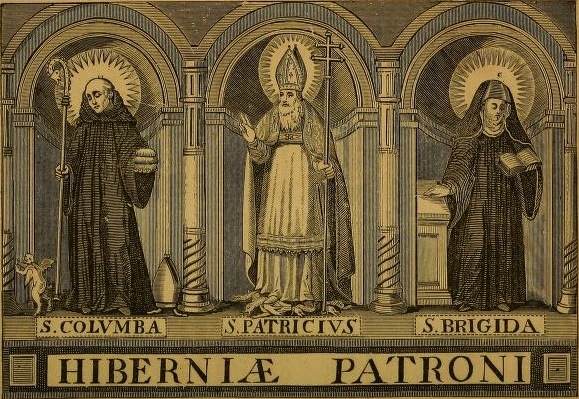 The biographical tract in question was translated, from Irish into Latin, by Father Thomas O'Sheerin, to serve the purpose of Father Godefrid Henschenn, who has edited it. However, distrusting much some poetic or irrelevant rhapsodies which he rejects, Father Henschenn has adopted a rescission he deems better suited, to elucidate the present Saint's history. The full text of this piece is now accessible to the Irish student, as the Leabhar Breac has been published; and it is interpolated with poetic effusions, in reference to the subject matter. Among these are lines, attributed to St. Cellach himself, but, most probably, they are only the production of a later period, than when he flourished. Some notices, in reference to him, have been entered in a work, compiled by Duald Mac Firbis; and, in the Book of Lecan, there is also allusion to him. In Rev. Jeoffrey Keating's General History of Ireland, this account is also found abridged. From these various sources, the following narrative has been derived. The holy man, whose biography we are about to treat, descended from a race of royal ancestors, whose actions have been chronicled, in the general annals of Ireland. Thus, St. Ceallach was son to Eugenius Belus — in Irish Eoglian Beul — King of Connaught; and, he had another brother, who was called Cuchoingelt, or Muireadhach. Among the bravest and most ambitious, vigilant and capable of administrators, in his age and country, Eoghan Beul ruled over the province of Connaught, with popular applause and good fortune, which he hoped might be secured for his sons. These named Ceallach and Muireadhach were lineal descendants of Eochaidh Muighmheadhoin, who flourished as supreme monarch of Ireland, about two centuries previous to their birth. At first, he was King over Connaught, when he married Mongfinn, sometimes called Munig, with Finn superadded, and by her he was father of four sons, Brian, Fiachra, Fergus and Olioll. He also married Carrina — said to have been a Saxon — and by her, he had a son, the renowned Niall of the Nine Hostages. According to the Irish pedigrees, Eogan Beul was the son of Ceallach, son to Oilliol Molt, son of Dathi, sometimes called David, son to Fiachra Follsnathach, son to Eochaidh Muighmeadhoin. His castle was built on an Island, lying in Lough Mask, and from him, it has since been called Inis Eoghain. It lies on the east side of the Lough, and the denomination is now written Inish Owen. It comprises over twenty-nine acres in extent of surface. The date of our saint's birth must been referred to about the year 520, according to the most probable opinion. He was the eldest son of his father, who selected for him a renowned and holy teacher. The young Prince Ceallach was placed at an early age, under the tutelage of St. Kieran, Abbot of Clonmacnoise. Charmed with the exercises of religious life, Ceallach resolved to embrace the monastic profession, and there he lived as a monk. Meantime, during the stormy period of his father's reign, Eoghan Beul was obliged to defend his principality by force of arms, from the attacks of turbulent and powerful tribes surrounding him. His principality was often invaded, but he usually repelled the invaders and scored a victory. However, a great confederacy of the people belonging to Tyrone and Tyrconnell, with other Ulster tribes, under the leadership of Ferguss and Donald, made an irruption into Connaught, and penetrated so far as the River Moy, carrying devastation along their course. This obliged Eoghan Beul to collect the forces of his province, and soon the rival armies came to blows. About the year of our Lord 537, a battle was fought at Sligo, and it was fiercely contested. The Northern army, however, gained a victory over the Connacians, who were obliged to yield, after an obstinate engagement. In it, Eoghan Beul received his death-wound, and he was borne from the field by his soldiers, who crossed their spears and lances, to support his body, and to serve the purpose of a litter. However, our saint's father survived the battle of Sligo — in which he was mortally wounded — for three days or, according to other accounts, for a week. Soon, afterwards, Guaire asserted his pretentions to rule over Connaught. At Clonmacnoise, Ceallach remained, until the disastrous issue of that battle had called him forth from his retirement on the Shannon. The Connaught chiefs, and especially these belonging to Hy-Fyachrach, deprecating the calamities which were likely to ensue for their province, held frequent interviews with their dying king, to ascertain his wishes in reference to a successor, and most likely to avert the crisis now approaching. During that interval which elapsed, after receiving his wound, and before his death took place, it is said, that Eoghan persuaded the tribe of Hy-Fiachrach, to elect his elder son as King of Connaught. His other son, Cuchoingelt, or Muireadhach, had not yet attained his majority. In accordance with this request of the dying monarch, messengers were despatched to Clonmacnoise, and to announce the result of that Sligo battle, with Ceallach's consequent promotion. These delegates were instructed, to represent the desperate state of their affairs to St. Kieran. The latter received them very hospitably, but he refused acceding to their wishes, as he deemed the monastic rules could not be dispensed with, in the case of Ceallach. However, the delegates remained therefor two days, and on the last night, they urged upon Keallach those arguments, which caused him to resolve on leaving Clonmacnoise. He was told, that he had been chosen unanimously by chiefs and people, to succeed his father on the throne of Connaught, and accordingly, the young prince accepted their nomination. Without communicating his intention to the saint, under whose guardianship he was placed, Kellach prepared to depart. For this apparent insubordination, St. Kieran is said to have pronounced a malediction, which was thought to have been prophetic of his future fate. With the usual ceremonies of inauguration, Kellach was elected King of the Hy-Fiachrach. After some time, however, the King of Hy-Fiachrach Aidhne revolted, as probably, feeling desirous to obtain the first distinction in that province. The isolated position of his district it would seem afforded him means and opportunity for insurrection. A public convention was held by the subordinate chiefs and people, in order to effect some terms of agreement. Great numbers of partisans on both sides were present. A treaty of reconciliation was arranged; and to this Keallach adhered in good faith, but his opponent was more wily and insincere. He invited Keallach to his fortress, and the latter accepted this invitation. He went thither, accompanied by a train of guards and followers. Notwithstanding, treachery seems to have been practised, for some of these were killed, while Keallach and twenty-seven of his followers saved themselves by flight. While revolving in vexation of mind a mode to be revenged on the perfidious king, a better thought at last presented itself to Kellach; for, recollecting the judgment denounced against him by St. Kieran, he resolved to quit once more the ambitious views and high station to which he had been drawn. Soon, therefore, he retired to a desert place, in the midst of woods, and then like another Peter, he wept tears of sorrow for deserting his Divine Master. Here, too, he remained for a year: and then, taking with him the twenty-seven companions, who were saved from death, Kellach resolved on returning to Clonmacnoise. Yet, he remained without this city, for a time; because, he felt a diffidence and reproach of conscience, at the presence of St. Kieran. There he waited admission, until some of the monks met and recognised him. They exchanged with him the kiss of peace, and promised to prepare the Abbot for an interview with his prodigal son, who had been dead to them, but who came to life again, who was lost and yet who had been found. He appears to have conciliated the favour of his former instructor, however, and the Abbot felt greatly rejoiced, that his spiritual son had returned to assume the yoke which he had borne in youth. Kellach fell on his knees before the Abbot. St. Kieran affectionately raising him said: "My son, I regret exceedingly I pronounced that malediction, when you deserted us, yet it is now irrevocable; still you shall not be deprived of reward and glory, if you only persevere and advance in your first vocation; bear then cheerfully the light and sweet yoke of Christ, than whose love nothing else can be so delightful, than whose company nothing can be more full of solace, while no kingly state or pleasure can be at all so glorious. These words gave great consolation to Ceallach, and prepared him once more for the sweets of a religious life. Having thus placed himself again under the direction of St. Kieran, Ceallach became thoroughly devoted to his master, and profited by his precepts. The Holy Spirit then poured on him the choicest graces. He sent away the band of seculars, who seem to have been his guards, to wait upon his young brother Muredach, who found refuge with his fosterer the dynast of Lugnia. With renewed ardour, Cellach followed the course of monastic studies and rules, so that he gave the greatest possible satisfaction to St. Kieran. At length, he was deemed worthy of being promoted to the sacerdotal grade. In due course, a vacancy occurring in the See of Killala, the clergy of that diocese, hearing about the merits and virtues of Ceallach, united their suffrages, to promote him as their chief Pastor. During the reign of Tuathal Melgarb, King of Ireland, who ruled from A.D. 533 to A.D. 544, Ceallach was elevated, it is thought, to the episcopal chair, as Bishop of Killala. Here, there is a remarkable round tower, standing quite perfect, and even retaining its original stone roof, of conical shape. Near it is the Protestant cathedral, rather a poor structure, and presenting no special feature of interest. The bishop's house was formerly in this town, celebrated for having been captured by the French, in August 1798. No vestige of the ancient church remains. To about the year 540, his acceptance of this dignity has been referred. But for the authority of this Life, we should look in vain to the authentic catalogue, for his place among the Bishops of Killala. Nevertheless, there can hardly be a doubt, that at least for a short time, he had assumed the office. Although Ceallach, as we are told, anxiously watched over the See of Killala; yet, he found time to visit Clonmacnoise most frequently, thus wishing to unite the fruitful cares of Martha, with the pious retirement of Mary. The revenues of his bishopric were spent, in providing for the wants of the poor, and in aiding those addicted to literary pursuits. Students flocked to him from all parts of Ireland, through which the fame of his holiness and liberality had spread. It appears that Guaire — from the period indicated he might be regarded as a distinct person from another Guaire surnamed Aidhne — became a successful usurper of the Connaught throne. He feared, however, the more rightful claims of the Bishop to that station he then usurped. Accordingly, Guaire conceived a mortal hatred towards Ceallach. At one time, the holy bishop had been engaged making a visitation of his diocese, and accompanied by a great number of his clerics being on his way to Kilmore, which was near the River Muad or Moy; Guaire, the son of Colman, happened to be residing at Duilus, with his son Narus, and with Neniedius, son to Fercogha. When Nemedius discovered, that the pious prelate had passed their house, without paying them a visit, he said to Guaire, "Unceremoniously and with little friendliness hath Bishop Kellach passed us by, as if he were hostile to us." "It matters not," replied Guaire, "that he has gone on his way, for I shall despatch a messenger to invite him, in my name, to return, and to hold a conference with us." Accordingly, selecting one of his confidants, the latter reached Kellach, at the end of that day's journey. He then told the Bishop, that Guaire felt displeased, because he had passed by, but still he requested, that Ceallach might return. It happened to be on the Sabbath eve, and the Bishop replied, that as the Sunday was approaching, he should be engaged all the day, either in celebrating the holy Sacrifice of the Mass, or in other sacred duties, at which Guaire who was near might assist, and even have an opportunity for an interview with him. The bishop declared, also, that if Guaire should come to him, on the Monday following, he would willingly return the visit. But, that messenger distorted the words of the holy bishop. Being a person of depraved mind and hostile to him, the envoy declared, that Kellach would not go to the king, nor did he show a friendly feeling towards the latter. Then, in a transport of rage, Guaire cried out: "Return to him again, and tell him, that unless he hurry away from these parts, on this very night, I shall burn down the church on himself and on his people." This threatening message was conveyed to Kellach, who relying nevertheless on Divine Providence remained there, until the Monday following. Then, he went to a village, on the borders of Lough Conn, where he spent that night. Afterwards, his course was extended towards Claon-loch. Here was an Island called Etgair, or Oilen Edghair, and over it in the air was witnessed a vision, representing a great number of Holy Angels. Moved by such a spectacle, the Bishop with his followers passed over the lake towards it. There, he discovered no sacred foundations had yet been established, nor was there any monument or memorial of a hermit known. Deeming the angelic apparition to denote this island, a the place for his future habitation, he resolved not to leave it. His clerics, who were with him, at first treated this resolve as one lightly made. However, they found it impossible to change their holy superior's purpose. Then, they received his instructions regarding the church of Killala, and learned the administrator's name, to whose care it was to be committed. Dreading the consequences of Guaire's anger, the Bishop thought it prudent to retire from his bishopric, that he might find a more secure retreat in solitude. He fled for concealment to Lough Conn. This is a very handsome sheet of water, in the barony of Tyrawly. It is about nine miles long, by four broad; in some views, it is prettily interspersed with islands, castles or abbeys. Hither Ceallach betook himself, resolving to live in complete seclusion. However, the fame of his holiness, and of his retirement from Killala, soon extended over the rest of Ireland. On that insulated spot, called Etgair, he built a hermitage. Meantime, his brother Muredach frequently paid him visits, to receive his advice, and to comply with his instructions. In this retreat, four ecclesiastical students had placed themselves, under the training and discipline of Cellach, and these are even called clerics. In the Latin Life of our Saint, these young men are named Moelcronius, Moeldalvanus, Moelsenachus, and Mac-Deoradius, or the son of Deoradius. There, they lived a whole Lent, engaged in pious exercises and offices, and under the direction of their holy instructor. However, the retreat of Ceallach was soon discovered by Guaire. This unhappy prince, on the whole anxious to do what he deemed to be just, was led astray by evil-minded sycophants. Probably instigated by jealousy and suspicion, when he heard of the frequent interviews between Kellach and his brother Muredach, Guaire conceived an idea, that the latter aspired to the kingdom of Connaught, while the bishop lent him counsel and encouragement to effect such a purpose. Naturally was Guaire averse to entertain any feeling, save that of respect and benevolence towards the holy Bishop; but, his evil counsellors, Narus and Nemedius, laboured by day and night to persuade him, that Kellach should be assassinated. To effect this dread purpose, many and false were the insinuations and charges concocted against him. However, Guaire would not enter into such a measure, for its sacrilegious and criminal intent caused him to receive it only with horror. His counsellors, Narus and Nemedius, then persuaded the king, to invite the Bishop to a public banquet, for the purpose of procuring a family and dynastic reconciliation. Their real purpose was to gain an opportunity, for taking Kellach's life, by administering poison. Accordingly, messengers were sent to the holy eremite entreating him to accept the king's invitation for a banquet, on a day appointed; but, he declined, on the pretext, that his present mode of living and his rule did not permit him association with worldly men and pleasures. Failing in this object, the messengers then entreated the bishop, to allow his clerical companions to visit Durlus, where Guaire lived. The bishop told them, that his students were free to go or stay, as they thought fit. Wherefore, these, having accepted the invitation of Guaire, set out for his fort, with the messengers. There, they were honourably received. After the royal banquet, when the clerics were placed on the right and left of Guaire, they were highly feasted, and they became intoxicated. Then, drawn aside to a secret chamber, the seducers approached them, and, while urging, that the peace of their country depended on Kellach's death, they bribed those four students, to murder their professor and spiritual guide. Their Irish names are given, as Mac Deoraidh, Maelcroin, Maeldalua, and Maelseanaigh. Not only promises of horses and herds, with other seductions held out, but even the whole territory of Tir-Amal-gaid, were offered to them, as the reward for their crime. Forgetting their sacred calling, and their intimate relations with Kellach, the unhappy young men agreed to execute the deed suggested to them, under the influence of drink. They retired to bed for the night, and the following morning, while sober, their purpose was not changed. All matters having been arranged for their departure from Durlus, the perfidious young men left Guaire, and confirmed in their resolution, to perpetrate a most revolting murder. Hiding arms under their clerical garments, those sacrilegious students returned to the boats, which were left on the shore of Claon-loch, and they sailed in them over to the Island. There was found their holy Bishop, intent on reciting his Psaltery; nor did he notice them, until his office had been finished. Then, he approached, and detected, in the changing countenances, eyes, and nervous motions of the young men, a presage of their wicked designs. He cried out: "O youths, you return to me with different looks, from those which possessed you on parting from me, and you have treacherously entered into Guaire's plots to murder me. Behold, my sons, you have assumed a base engagement, by following wicked counsel, and therefore set it aside; if you adopt this my advice, you will gain a greater reward, than any Guaire could offer." The students were somewhat moved, on hearing these exhortations; but, recognising the dire plot, which had been forced on them, they now urged, there could be no withdrawal from such a promise, and they objected, too, that by falsifying it, they could not find in all Hibernia a place of security, against the power and vengeance of Guaire. All their holy master's expostulations and arguments were vainly urged upon minds, so strongly possessed by satanic promptings. They seized upon him, and dragged him to the edge of the island, by force and violence. Then, they placed him in a boat, which was steered for the mainland. There, he was led into a thick wood, near the shore. Keallach still continued to protest against their treacherous designs, and he endeavoured once more to dissuade them, by stating, they could find refuge from Guaire, at Clonmacnoise, or elsewhere, and under the protection of some, among the Irish kings. Finding those wicked young men would not desist, he entreated a respite for one day more. This request was reluctantly granted. When night came, they placed him within the hollow of an oak tree, and kept a watch at its opening. However, the youths were oppressed with fatigue, and they fell into a deep slumber. A thought came into the mind of Kellach that he might now escape. However, recollecting the prophecy of St. Kieran, in his regard; the holy man deemed, that the Divine decree should be there awaited, both as to death and judgment. "It is better for me," he mused, "here tranquilly and courageously to meet my death, than to fly and to be slain, as a coward, when weakness and hunger should cause me to fall into the hands of my oppressors." Accordingly, he remained there tranquilly until daybreak, while engaged in prayer and holy contemplation. This was to be his last day upon earth; and, at dawn, for a moment, Keallach withdrew from the light, into his hollow cave. Yet, ashamed of his pusillanimity, he soon came forth again, to hear the birds sweetly singing, and the woods resounding their notes, as the morning began to brighten. On the night of Wednesday, the Bishop had a remarkable vision, during his sleep. He dreamed, that four mastiff dogs had attacked and torn him violently, through ferny ground, and next had dragged him into a whirlpool, whence he could not escape. This Ceallach considered, as indicating the sort of fate, he was now destined to experience. The holy man then burst into accents of praise to the great Creator. He sang a hymn in Irish, the text of which has been preserved in a metrical form. Afterwards, Kellach was drawn forth, from the hollow of the tree, by his perfidious disciples; and, he was struck repeatedly, until life became extinct. While the blood flowed from his body, the wild beasts and birds congregating there tore it in pieces. Before leaving, Mac Ueoraidh, Maelcroin, Maeldalua and Maelseanaigh, appear to have left the bleeding remains in the hollow tree, as if for concealment. The persons, who committed this barbarous murder, are called foster brothers to the saint. When he had been slain, they hastened to the fort of Guaire, and there he is said to have received them, with joy and favours. These base murderers had thus beset the man of God. His assassination is said to have occurred, in the southern part of Tyrawly. The murder was perpetrated, according to a popular tradition, between Lough Conn and Lough Cuillinn. The particular place is stated to have been Addergool. As a reward for their treachery, the territory of Tyrawly was given to the assassins, by Guaire, which seems to mark, not only his complicity with, but even his high approval of, their crime. They erected a stronghold, at a place called Dun Fine, which lay within that territory, and here they took up an abode.This barbarous deed was afterwards revenged by Cucoingelt. On the very day of its occurrence, he had come on a visit to his brother; but, not finding him at Oilen Edghair, and having had some intimation of designs entertained by Guaire, at once, Cucoingelt began to suspect that his brother had fallen a victim to his enemy's wiles. Having instituted the necessary enquiries, regarding the time of Ceallach's departure from the hermitage, and his probable route; after some search, Cucoingelt discovered the mangled remains of his deceased brother, concealed in the hollow trunk of an oak. These were disfigured and scarcely recognisable, as wolves and birds of prey had been attracted to this place, by the effluvia proceeding from the dead body. Cucoingelt performed the last sad offices, towards those lacerated remains of his sainted brother. At first, he applied to the clergy, at Dunmore —afterwards called Turloch church — for permission to bury the body there; but, dreading Guaire's resentment, they refused this request. The place is now known, in connexion with a ruined church, and a well-preserved round tower. Afterwards, Muiredach besought the priests in charge of Lis Caillain church, to grant the same favour, but he was again denied the privilege sought. This refusal sorely grieved him, and he retired from this place with an aching heart, when suddenly fire was seen to descend from Heaven, while, in his presence and in that of his companions, the church was entirely consumed. It was never afterwards restored, to that time, when St. Kellach's Life had been written. Another remarkable miracle followed close on the foregoing incident. The crowd of noble mourners stood around the coffin, not yet resolved what to do. Two stags then appeared, and drew his body to its last resting-place; nor was there a mortal to guide them. The funeral cortege followed the direction they took, and the mourners were even consoled, because of this extraordinary manifestation by Divine Providence. At length, the deer drawing the coffin, to which they had been harnessed, stopped before the door of a certain oratory. Then, suddenly rang out the church bell of its own accord, as if to welcome there the sacred remains. These were deposited in Eiscreach church, with becoming solemnity, psalms, canticles and sacred rites being employed. Angels in great numbers were seen above the grave, and the people of that place felt greatly rejoiced, to have such a precious deposit committed to them. Then is furnished a sequel, to the foregoing beautiful legend. The stags, when unyoked from the saint's coffin, would not stir from the place; but, like beasts of burden, they became domesticated, and they served the inhabitants while ploughing, and during other rustic operations. Each evening, when loosed from the yoke, they sought holy Kellach's grave, and licked it with token of affection. Thus, did those mute animals teach the people there to venerate the saint, and to pay constant honours to his memory. While standing over those mangled remains, as they were consigned to the tomb, Cucoingelt's outraged feelings found vent, in a vow of vengeance, against the perpetrators of this barbarous murder. He is related, to have chanted a dirge, or caoin, over the body of Ceallach, as it was lowered into the grave. Cugoingelt then put in train of action his designs for revenge, and in a manner, as singularly conceived, as it was fatal and effective in execution. Time was required, for the maturing of his object; and, then, having assembled about three hundred of his retainers and relatives, this chief retired with them into Hy-Many territory, where he lived with that armed band of followers, during one year. He afterwards spent some time in Meath, where he married Aife, daughter to Blathniac, King of Ireland. But, at length, he returned to Tyrawly. Having procured the friendly assistance of a swineherd, to whom he discovered his intention; this man entered warmly into his plot, and procured its successful accomplishment. The prince, having disguised himself as a swineherd, was admitted to the fort of Dun-Fine, and as a companion of that menial. Cucoingelt had previously posted his armed bands, in the neighbourhood of Dun-Fine castle, that they might be ready to surprise it, when a signal should be given. During a banquet, Cellach's murderers, with their guests and vassals, became stupidly intoxicated; and, this being an opportunity the prince so egerly desired, he despatched his friend the swineherd, to give notice to his men, that their time for action had arrived. Immediately, they rushed forward and surprised the castle. Having slain its guards and vassals, they spared the guests. The four murderers of holy Bishop Cellach were seized, and bound with chains; while the guests, who were made aware of those circumstances, and the disguise assumed by Cucoingelt, felt rather pleased than otherwise, at the success of his plot. They even drank to the avenger's fortunes. On the day following, the murderers were brought in chains, to a place called Durlus Muaidhe, and across Lec Durluis until they arrived at Ardnarea, or Ardnaree, on the River Moy. Here, they were executed, in a manner characterizing Cucoingelt's barbarity, even allowing for the dire provocation he had received. One account has it, that the assassins were torn to pieces, by wild horses; while, according to others, they were hanged. The Hill of Ard na Riagh is in the parish of Kilmore Moy, and barony of Tirawly, a short distance to the south of Ballina. It is a remarkable cromlech, supported by three pillar-stones, and fixed as level as a horizontal dial. Situated on a hill to the west side of the River Moy, and nearly opposite to Ard-na-Ree, is shown Ard-na-Maol, or the height or hill of the Afaols, i.e., where the four youths, whose names began with the word Maol, were interred. The monument raised over them is yet in existence. Afterwards, Cucoingelt received the submission of the Tir Fiachrach and Tir Amhalgaidh tribes, with hostages; and, he banished Guaire to Me southern part of the province. Here, he drove the usurper, within the territories of Tir Fiachrach Aidhne; and, his previous extent of sway over Connaught was now confined, to a very small district of that province. Thus was a foul murder avenged, by a retribution, barbarous and revolting, it is true; yet, who shall say, the sufferers in this life had atoned for a deep crime committed against God's holy law? In the Dunkeld Litany occurs the name of a Bishop Kellach; but, it does not follow, that he was identical with the present holy man, so named and distinguished in ecclesiastical rank. In the published Martyrology of Tallagh, at the 1st of May we find the entry of Cellan h Fiachrach; and, this also very nearly corresponds, with what is given in the Franciscan copy, at the Kalends of May. On this day was celebrated the festival of Ceallan Ua Fiachrach, as we read in the Martyrology of Donegal. In the foregoing tragic and afflicting narrative of St. Ceallach's Life, we have several useful lessons presented. In the first place, his own inconstancy of resolution to persevere in the religious state, on which he had entered, and his disobedience, marked with the denunciation of his holy master, St. Kieran; next, the fatal suspicions excited, jealousy and envy creating the plot laid to repress his apprehended worldly ambition; then, his death resolved on, and attended with circumstances of such atrocity and perfidy, although the holy man was not unprepared, for his departure from life. Again, it may be seen, that when murder has been perpetrated, and with imagined secrecy, impunity seldom attends the murderer, detested by his fellowmen; discovery of the deed and the perpetrators is usually followed by condign punishment; while, worldly interest or satisfaction soon ceases to hold out advantages, for the wretched miscreant. Vengeance is the Lord's, and he will repay — frequently in this life, but assuredly in the next, where grievous crimes unrepented of are never to be expiated, for the tortures of the damned shall there last, for ever and ever.